The trial provides a model for more efficient, cooperative trials and is the product of years of collaboration between the U.S. Food and Drug Administration (FDA), National Cancer Institute (NCI), National Institutes of Health (NIH), Foundation for the National Institutes of Health (FNIH), research institutions, patient advocacy groups, and industry. Lung-MAP was first proposed at the 2012 Conference on Clinical Cancer Research hosted by Friends and the Engelberg Center for Health Care Reform at the Brookings Institution. Friends, in conjunction with its government (FDA, NCI, NIH) and industry partners, developed a clinical trial design in a series of workshops, forums, and working groups. The final design was announced at the 2013 Conference on Clinical Cancer Research, along with the first five drugs to be tested. Active since 2014, Lung-MAP is constantly adapting to the fast pace of science and the drug development landscape. 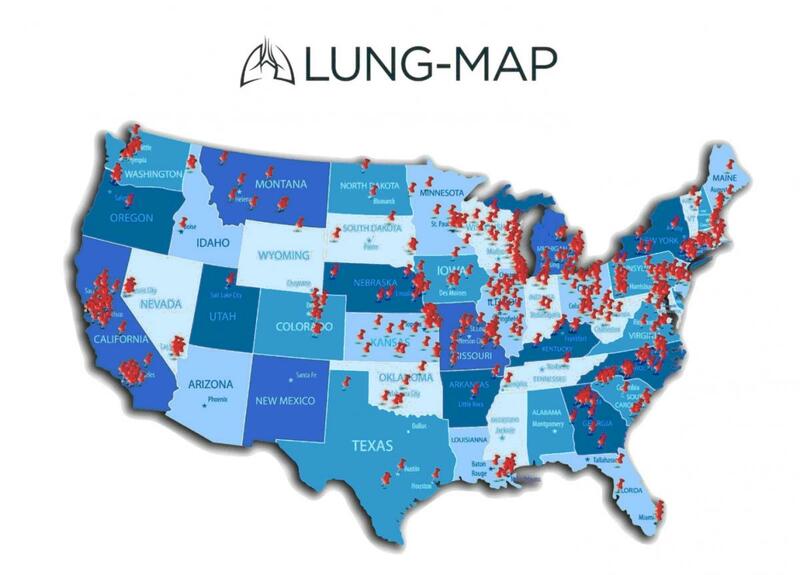 As of September 2017, Lung-MAP is operating at more than 700 sites across the country. To find a Lung-MAP site closest to you, go to www.lung-MAP.org. Lung-MAP (SWOG S1400) is a multi-drug, multi-sub-study, biomarker-driven squamous cell lung cancer clinical trial that uses state-of-the-art genomic profiling to match patients to sub-studies testing investigational treatments that may target the genomic alterations, or mutations, found to be driving the growth of their cancer. Instead of having to undergo multiple diagnostic tests to determine eligibility for many different studies, enrollees are tested just once according to a “master protocol” and assigned to one of multiple trial sub-studies, each testing a different drug from a different developer. That means shared information and infrastructure, better access for patients to promising drugs, better access for researchers to relevant enrollees based on their genomic profiles, and less time and money needed before investigational drugs can be tested. Patients are screened using a comprehensive genomic profiling platform that reviewed more than 200 cancer-related genes for genomic alterations. Based on the results of this screening, patients are assigned to whichever one of up to five sub-studies testing different investigational regimens best suits their genomic profile. This innovative approach improves a patient’s likelihood of receiving a drug that will work for them while allowing for new therapies in development to be added as the trial progresses. "This trial is breaking down the old paradigms of traditional clinical trials, allowing multiple enrollees to be tested and assigned to the treatment most likely to work for them"
Ellen Sigal, Chair and Founder, Friends of Cancer Research. "Lung-MAP takes advantage of new advances in biomarkers, targeted therapies, and advanced stage cancer treatments, while tailoring these treatments to those who need them most." Lung-MAP is an unprecedented, public-private collaboration between: the National Cancer Institute (NCI), NCI’s National Clinical Trials Network, SWOG Cancer Research, Friends of Cancer Research, the Foundation for the National Institutes of Health, several pharmaceutical companies (Amgen, Bristol-Myers Squibb, Genentech, Pfizer, AstraZeneca, and AstraZeneca’s global biologics R&D arm, MedImmune), Foundation Medicine, and several lung cancer advocacy organizations. Taking an investigational drug from the initial discovery stage through clinical testing and regulatory review is complicated, expensive, and inefficient. Trials are difficult to initiate, infrastructure-intensive, subject to lengthy regulatory review, and reliant on the enrollment of volunteers—all challenges compounded by the fact that investigational drugs are almost always tested in separate research studies, even when multiple drugs are being developed to treat the same condition. While the rise of precision medicine has improved many aspects of patient care, it has also exacerbated the challenges of running a clinical trial. Smaller, targeted patient populations have made it more difficult to recruit eligible patients. And reliance on multiple, single-gene diagnostic tests can increase infrastructure costs, complexity, and patient burden. This trial has the potential to change and accelerate the way investigational biomarker-defined therapies are tested and approved for lung cancer, and will hopefully do the same for many other diseases.